Hey there Dedoosers! Fresh off the brains here at support, today’s blog will go over the various exports Dedoose can produce as well as what you can do with them. Exports are an important part of using the application: using the different exports we can review large amounts of excerpts, transfer data between projects, and several other tasks that may be useful for you and your team. Likely the most common export out of Dedoose is an export of the excerpts. Available in either Excel or Word, this export will produce an excerpt list of your choosing. This can be very useful in reviewing the coding done by researchers, once in Excel we can turn the data set into a table giving us all the options we could ever want in arranging the data and comparing excerpts and codes applied to those excerpts. This is also the kind of export you are going to want for calculating the inter-rater reliability, described in another blog here. Excerpt exports can be brought out into Excel or Word and allow you a bevy of exporting options. Checking the box next to an option will include the associated data in the export, a quick summary of what each option refers to is below. Next up let’s talk about descriptor data. Users often populate the Descriptors tab with a spreadsheet, creating both set fields and descriptors at once. This occasionally leads to our first most common error. While the survey importer is pretty good at interpreting data, nothing is perfect. Occasionally a set field may be misinterpreted, for example an intended option list might be created as a text field. A continuous numerical value gets wrongly interpreted as an option list. 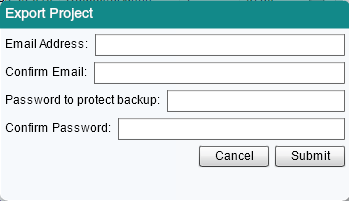 We often advise that instead of going all the way back to the beginning and trying to import the spreadsheet again, you just change the field type (New as of Dedoose 8.1 here). Let’s say our option list was wrongly interpreted as a text field. All the data we need is there, we just want to be able to group our results based on the repeated responses. First, we double click the erroneous field under Set Fields in the Descriptors tab. Click Change next to Field Type, select the Option List type, and hit Submit. Your field will now be changed and is immediately available for analysis! It can sometimes be useful to transfer the set fields of a descriptor set, although not the data itself. We have another export for this, you can easily export the set fields of a descriptor set for easy recreation in another project. This export is available from the ‘Descriptors’ tab above the set field window in the lower left. Simply export the set fields out of the project and then load the newer project and import them, voila, a copy of the set fields in your new project that match the set fields of the previous. We have a similar export for codes, perhaps you’ve developed a code tree that works well in several different studies. No need to create an all new code tree from scratch if we have one already, simply export the code tree out of the older project and then import it into the new one. Just a quick way to get the information present in the project. What if we just want to know about the media in a project. Not the text of the media, not the excerpts, just the media files and a little bit of information relevant to them. An export of the media will give us the titles of all the media in our project as well as the descriptor data associated with this media. This can be useful in several ways, if we haven’t actually linked our descriptors to our media and we wish to use auto link, described in more detail here. With this export we can arrange the media to correspond with our descriptors and create a new column with the media titles in it. This will allow us to auto link the descriptors to the media, saving quite a bit of time in the process. Memos! Researchers often use memos to track their activity or thoughts while doing work within a project and there are times, we may want to analyze these memos. 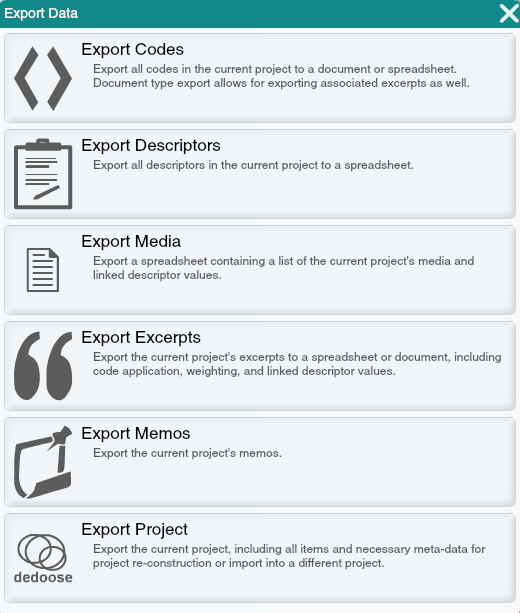 We can export all the memos of a project quite quickly and then proceed to review them. If you’d like to code the memos instead, know you can do so with the Create Document Copy function as well. Lastly, and arguably most important, we have the project export. We often advise using this as a backup of your project, the zip file produced can be stored locally and will quickly and easily recreate a project within Dedoose. Anytime our users are thinking about something like importing a large spreadsheet in addition to a preexisting data set, performing retroactive upcoding, or any of a series of actions that are essentially irreversible we advise performing this export first, just in case. We have another blog about this here. It is also important to note this isn’t an export to be used outside of Dedoose. The XML and supporting data within the zip file are largely metadata meant for our system to recreate the project from the back end.